I’m not trying to hide the fact that I have a bit of a thing for chairs. I picked up a set of Chippendale chairs off of craigslist a while ago. I’ll admit that I didn’t even know exactly where they would go, but I could not pass up these beauties. There were three armchairs, and you may remember I painted these black and reupholstered the seats with a complementary lattice print. They make beautiful side chairs in our living-dining room. Next up were the four side chairs. I originally thought I would use them for an eat-in area in our kitchen, but when we renovated, we ended up with seating at the island, instead of a separate table. Not to worry, though, the side chairs have found a home in our family room. This room is decorated with lots of white, as you can see in our “built-in” fireplace wall, and blue, as you can see in the new graphic pillows, so I found a print for the seats of the chairs that would connect to these colors. I love how the modern print makes these traditional chairs feel more contemporary, and the circles complement the angles of the lattice. 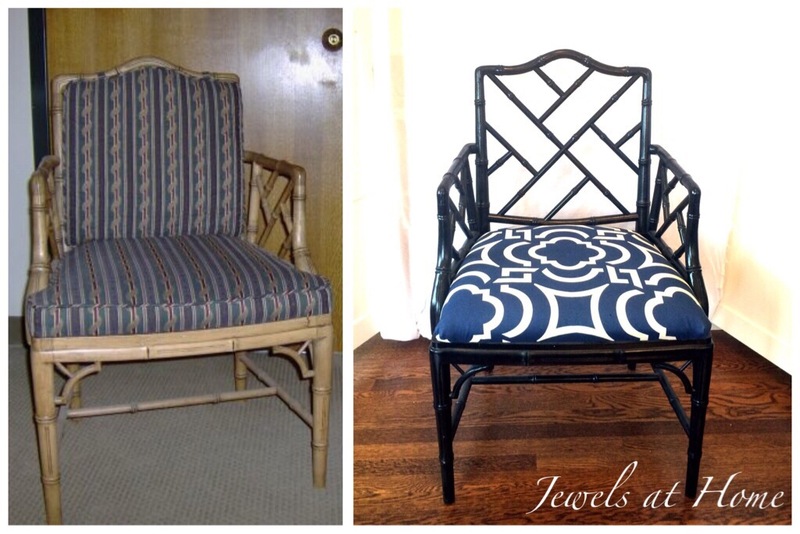 And a final look to see how all these chairs were transformed from stuffy to stunning! So fun! So fun! Funny story. Some of you know that Steve is an avid runner, and I honestly believe I get the same endorphin rush from completing a fun makeover project like this one. Isn’t that crazy?